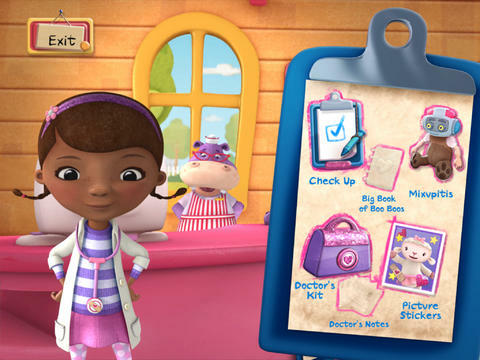 Based on the hit Disney Junior show Doc McStuffins, join Doc, along with Hallie, Lambie and the rest of her friends for a fun-filled time fixing, sorting, exploring and caring for toys, dolls and more. Inside Doc’s clinic you can choose from four entertaining and engaging developmental activities. • Check Up – Do you have a case of driedout-a-tosis? With Check Up you will diagnose and cure a wide variety of patients with a number of different symptoms. Patient will even get a loving cuddle from Lambie. • Mixupitis – Oh no…some of the toys have mixuptitis and all their parts are mixed-up. Can you help fix them by putting the parts in the right place? • Doctor’s Kit – A good doctor always keeps their kit handy. In this open-ended activity use your device’s camera to perform check-ups using the virtual stethoscope, otoscope and X-Ray. As you play, the Big Book of Boo Boos will save the names and diagnosis of all the patients you cured so you can look at them anytime. You will also earn different Doctor’s Notes that prescribe lots of love, kisses and cuddles.